How many young women can cope with tremendous loss and disappointment on their own with no family or friends? Ella has spent her life on the run, supposedly from the Russian Mafia, and is now living in an attic apartment after the recent deaths of first her mother and then her grandmother in Confessions of a Neighbor: A Mystery in Switzerland by Heather Nadine Lenz. Trying hard to become part of a ballet troupe, Ella suffers rejection after rejection until an unexpected opportunity comes her way. In the meantime, having no social life of her own, Ella has developed an unhealthy attachment to a neighbor she observes regularly from her window. Seeing him abused by his wife, Ella becomes protective of Owen and falls for his lines about caring for her. Ella’s co-workers warn her to avoid him, but circumstances take a shocking turn, forcing her to feel even more insecure. Only dancing eases her emotional pain, but given the events that have been set in motion, will that even be an option anymore? Amazing scenery, vivid descriptions and intense emotions are just part of the appeal of Confessions of a Neighbor: A Mystery in Switzerland by Heather Nadine Lenz. In this hard to put down story, you develop a real attachment to Ella and suffer along with her as she deals with issues from her past, her insecurities about the future, and the everyday struggles of trying to live while following her dreams. Wonderful descriptions of setting and ballet add a lot to the realism of the story. Well done! Psychological manipulation plays a large part in the story and Lenz sets the scene slowly and deliberately, then shocks you when the trap is sprung. This is a book that is well worth reading on many levels. 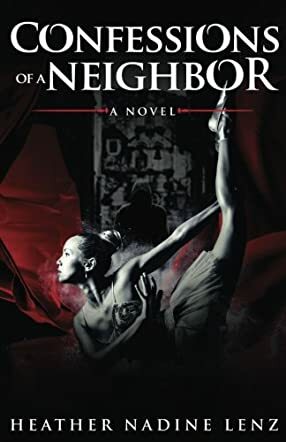 Confessions of a Neighbor by Heather Nadine Lenz tells the story of Ella, a hopeful 16-year-old ballet dancer whose dream is to one day be able to make a living as a ballerina. Fate, however, has other plans for the young woman who lost her mother as well as her grandmother far too early. She is lonely and ends up falling victim to an evil scheme. Fortunately, she also has someone who is secretly looking out for her well-being. But the eyes of that secret helper cannot be everywhere. Ella ends up in one bad situation after the other, and readers will wonder whether she’ll ever have a proper lucky break. While I usually don't enjoy romance/real life novels that much, I enjoyed reading Confessions of a Neighbor by Heather Nadine Lenz. Sometimes I found Ella’s behaviour really dumb – but I guess you can’t expect much more from some young people. If she hadn’t been that naive, the problems in the book would not have appeared and there would not have been a plot at all. I found it very interesting to see how the plot played out and how some issues were resolved. I don’t know how realistic the end solution really was, but it’s fiction, so it doesn’t really have to be 100% realistic. I would have liked to see a bit of a faster pace in some chapters and more conflict in others – but, overall, the book is a very nice read for in between other books. If you need an easy, partially exciting – but not too exciting – book, then I would recommend you to go for this one.